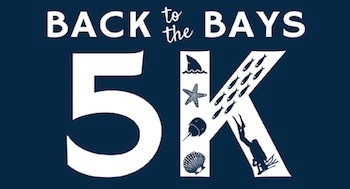 Cornell Cooperative Extension of Suffolk County’s Marine Program will present its Second Annual “Back to the Bays 5K on Saturday, May 14. The course starts and ends at Cedar Beach County Park in Southold, and features stunning views of Peconic Bay and its creeks and tributaries. Following the race, runners and the general public are invited to CCE’s Open House and Family Fun Day on the grounds of CCE’s Marine Environmental Learning Center, located next door to the race finish line at Cedar Beach County Park. Proceeds will support Cornell Cooperative Extension’s Back to the Bays Initiative, which connects the public with opportunities to get involved with efforts to protect water quality, enhance marine habitat, and restore shellfish and finfish populations to our bays. The race begins at 9 a.m. General registration is $25 and registration for Back to the Bays members is $20. Registration is online at ItsYourRace. The first 50 registrants are guaranteed tee shirts, and there will be post-race refreshments and an award ceremony for winners in each category. Awards will be given to top runners in each category: 8-12, 13-19, 20-29, 30-39, 40-49, 50-59, 60-69, 70-79, 80+. For the safety of all participants, strollers, baby joggers, bicycles, roller blades/skates, skateboards and pets are NOT permitted on the race courses. The Marine Program, which became part of CCE in 1985, is charged with protecting our waters and providing a clean environment for our fish, fowl and plants. Projects have been designed to bring back our once thriving eelgrass and shell fish populations, ensure our commercial fishing industry continues to thrive while limiting bycatch, provide public education about environmental consequences of storm water runoff, and introduce our young people to marine sciences and marine life on Long Island. The Back to the Bays Initiative is an effort to increase stakeholder engagement in CCE’s water quality protection initiatives, habitat improvement projects, shellfish and finfish research and restoration and youth and community education experiences.